For optimized reliability, LG NeON 2 utilizes Cello™ technology, which consists of 12 thin wires instead of 3 busbars. Circular-shaped wires effectively scatter light while minimizing electrical loss. 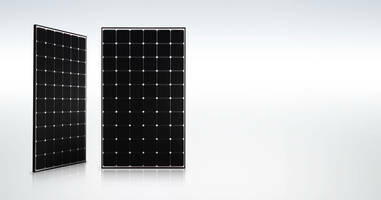 Rated at 320 W, panel boasts 6.4 kWp capacity with 20 modules (60 cells). Unit is suitable for homeowners who want to maximize energy production potential within limited rooftop space. Annual degradation has been reduced by max of 2% in first year and not more than 0.6% in following 24 years. SAN FRANCISCO, – LG Electronics today announced that its most innovative and efficient solar power system ever, the LG NeON 2, will be available in the United States in August. Demonstrated here in advance of the Intersolar North America trade show, the LG NeON 2 is equipped with newly developed LG "Cello" technology. The innovative Cello technology consists of 12 thin wires instead of three busbars, which offers significantly improved performance and reliability even over the original NeON™ high-performance solar panel. For its "groundbreaking idea and technological innovation," the LG NeON 2 was recognized last month with the Intersolar Europe Photovoltaics Award. Also new from LG Solar this fall in the United States is the "Mono X® NeON 72," the all-new series of 72-cell solar modules, ideally suited for commercial installations. In addition to traditional rooftop installations, leading applications will include carports and space-constrained ground mounts. Two models will be available, designed to deliver high-efficiency output of up to 360 and 365 watts respectively, in a giant 77- by 39-inch panel. This new series builds on the success of LG's award-winning 60-cell Mono X NeON that uses LG's N-Type double-sided cell structure that allows the light reflected from the rear of the module to be reabsorbed, also generating additional power. The flagship LG NeON 2 produces superior power performance with less hassle, creating new standards of quality within the solar power market. Cello -- which stands for Cell Connection, Electrically, Low Loss, Low Stress and Optical Absorption Enhancement -- utilizes circular-shaped wires to scatter light more effectively for better absorption, while reducing the electrical loss by spreading the current with 12 cell busbars. "The LG NeON 2 combines a new level of performance and flexibility for both home and business owners seeking to gain energy independence," said Ellen Kim, senior vice president of LG Electronics USA's Energy Solutions business. "With this latest breakthrough product, LG continues to stay one step ahead in the industry, exemplifying the kind of innovation required to help alleviate today's environmental challenges." The NeON 2 is ideal for homeowners who want to maximize the energy production potential within a limited rooftop space. The 320W NeON 2 boasts 6.4 kWp capacity with 20 modules (60 cells) while the capacity of a 285W p-type Mono with the same number of modules generates only 5.7 kWp and the capacity of a 255W p-type Poly with the same number of modules generates only 5.1kWp. LG's highly efficient panel allows for seamless installation in a module array on the roof regardless of its surrounding environment. Due to the special benefits it provides, the NeON 2 is suitable for installation in large-scale systems as its 60 cells can achieve higher power output than some 72-cell modules. "Balance of System" features have been incorporated into the NeON 2 to reduce the total number of strings, based on its higher efficiency and lower voltage. As a result of the improved temperature coefficient of the LG NeON 2, it can generate more electricity on a sunny day and even performs more efficiently on cloudy days. Whereas conventional p-type modules suffer from Light Induced Degradation (LID), the NeON 2 modules use n-type Multi-Wire Busbar (MWB) cells for increased performance and reliability. As a result, the annual degradation has been reduced by a maximum of 2 percent in the first year and not more than 0.6 percent in the following 24 years. This means that users will receive at least 83.6 percent of the initial output after 25 years, as opposed to 81.2 percent from previous generations. Moreover, given the NeON 2's improved firmness, which is a result of a reinforced frame design, LG has extended the product warranty to 12 full years. For more information on LG's full lineup of energy efficient solar offerings, please visit www.lgsolarusa.com.